The famous chicken chain and other restaurants like Denny's are stepping up after Hurricane Florence. 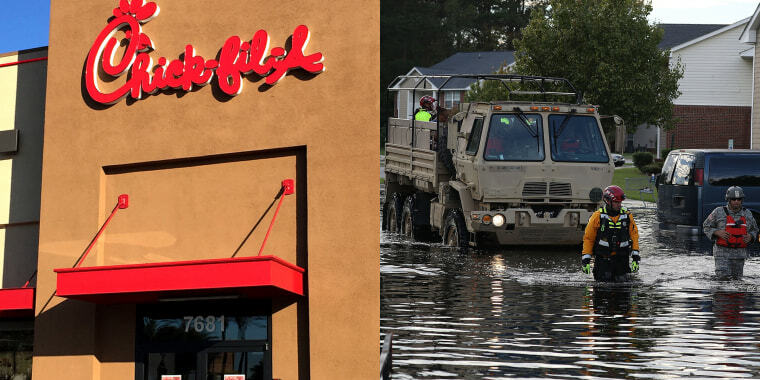 In the wake of deadly Hurricane Florence, some fast food restaurant locations in the Wilmington, North Carolina, area are offering free meals to first responders and locals. Chick-fil-A, America's beloved chicken chain, and Denny's are among those restaurants trying to help those affected. The hurricane pounded North Carolina (and parts of South Carolina) with heavy rain beginning on Saturday and caused major flooding in several parts of the state, according to NBC News. "Rescue crews in North Carolina waded through heavy flooding Monday in search of stranded residents after the remnants of deadly Hurricane Florence sent water rushing over riverbanks — spurring the governor to warn that there's no immediate relief from the 'monumental disaster,'" NBC News reported on Wednesday. On Thursday, four Chick-fil-A locations in the Wilmington, North Carolina, area started offering free meals to first responders, emergency personnel and linemen (people who work on electrical lines) from 10:00 a.m. to 4:30 p.m. local time. The workers will have access to the restaurants' dining rooms and the drive-thrus will be available to the general public. This is the first time that the locations have reopened since the hurricane hit the area. The four Chick-fil-A restaurants are located at 3389 Oleander Dr., 5106 S. College Rd., 5123 Market St. and 6891 Swan Mill Rd. Another Chick-fil-A in Raleigh, North Carolina, was praised for serving relief workers "500 sandwiches and 1,200 nuggets" on Sunday, a day when all of the chain's restaurants are usually closed to give workers more time to spend with their families. On Friday, Denny's Mobile Relief Diner, a 53-foot 18-wheel truck outfitted with a large kitchen that's dedicated to feeding people after natural disasters, will serve food to first responders and locals from 7 a.m. to 1 p.m. at Wilmington's United Advent Christian Church (4912 S. College Rd.). As it moves around the area, the relief truck will post its location details daily on Twitter. The truck's kitchen will serve pancakes, bacon and more. The truck originally launched on Aug. 30 and started by serving food in Redding, California, to people affected by the state's wildfires. Its mission is to drive around the country to "assist those in need." We will be at the United Advent Christian Church located at 4912 S College Rd, Wilmington, NC 28412 tomorrow September 21st from 7am - 1pm. McDonald's has pledged $500,000 to the American Red Cross for Hurricane Florence Relief and said that "several owner/operators across the affected area are working to feed first responders, for free, as they continue to serve their communities," according to a press release on Wednesday. A representative for the company was unable confirm to TODAY Food which specific locations are feeding first responders at the time of this story's publication. Large chain restaurants haven't been the only ones helping out during the crisis. Michael and Chrislyn Wedderien, owners and operators of Carryout by Chrislyn in Washington, North Carolina, delivered 332 free meals to first responders on Friday, according to WITN, an NBC affiliate. The restaurant isn't slowing down this week, either. On Wednesday, Carryout by Chrislyn said that it has since served over 2,046 meals to those in need. Chrislyn told WITN, "I just try to bring goodness into the world, one meal at a time."